Formulated with 100% drug-free, nutraceutical ingredients are clinically shown to improve hair growth. Earn up to 79 LuxePoints Points. 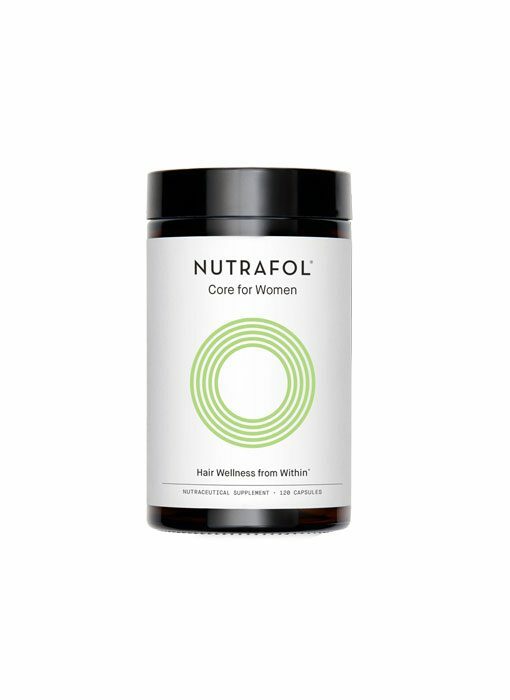 Ingredients in Nutrafol Hair Growth Supplements formula address existing hair loss and thinning, and also serve as a preventative and anti-aging regimen to maintain healthy hair growth and thickness. 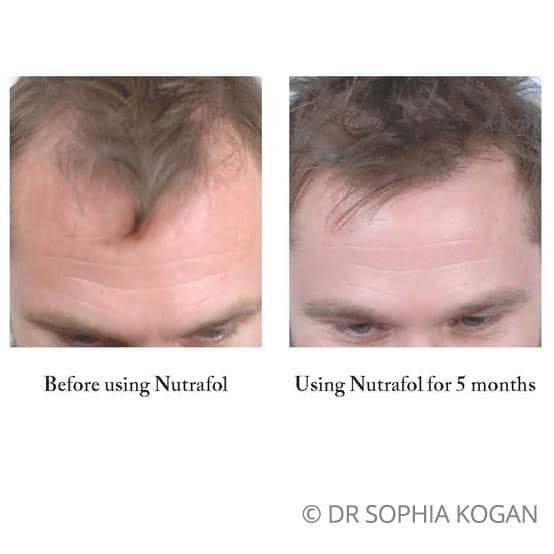 Nutrafol can be used alone or in conjunction with other treatments like hair transplant and PRP. 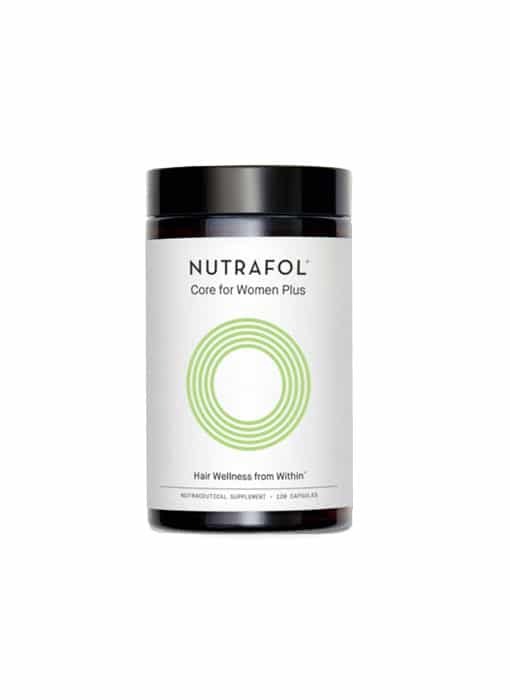 Nutrafol is available in 3 formulations: Women, Women Plus and Men. The Women’s Plus formula is recommended for women in menopause or with high levels of testosterone. A whole new approach to healthy hair growth. 100% drug-free, natural ingredients are clinically shown to improve thinning hair and overall health. Endorsed by 1100+ physicians and top stylists nationwide. Excellent as a preventative for those with early signs of hair health changes, or if you just want to have thicker, fuller, healthier hair. Evnolmax® – A form of Vitamin E extracted from EvNol palm oil, was shown in a clinical study to support healthy hair growth. Sensoril® Ashwagandha – Clinically tested to decrease the levels of hair damaging stress hormone Cortisol by up to 30.5%*, reduce inflammatory C-reactive protein (CRP) by 35.2%* and improve resistance to stress. BCM-95® Biocurcumin – The “Swiss Army knife” of botanicals, curcumin is a potent anti-oxidant and has been shown to lower inflammatory biomarkers, like CRP, in clinical studies. Extracted from turmeric, curcumin optimizes the immune system + fights many inflammatory molecules that interrupt optimal hair growth. USplus® Saw Palmetto – Extracted with a dual-patented CO2 ultrahigh-pressure technology. Saw palmetto is shown to help prevent testosterone conversion to DHT, a naturally occurring hormone in the body that contributes to thinning hair by shrinking hair follicles. Cynatine® HNS – A solubilized, more bioavailable and bioactive keratin provides the building blocks of hair – amino acids like cysteine and proline. Hydrolyzed Marine Collagen – Rebuild the structural integrity of the hair follicle environment, improve moisture, and promote diffusion of nutrients. Hydrolyzed to a low molecular weight for better bioavailability. USPlus® Saw Palmetto – Clinically tested to help prevent the conversion of testosterone to DHT, a hormone linked to thinning hair through miniaturization and fibrosis of the hair follicle. Organic Maca Root – Sourced from organic farms in Peru, Maca is shown to naturally promote the balance of hormones. Changes in hormones during menopause have been linked to poor hair health. Astaxanthin – A potent antioxidant known to promote healthy aging and longevity. Black Pepper Fruit Extract – Extracted from the black pepper fruit and standardized to 95% piperine, the patented Bio-Perine® in Nutrafol plays an important role in the absorption of bioactive nutrients that are necessary for healthy hair. Its active ingredient, piperine, enhances the body’s ability to produce heat and energy, which allows many of the vitamins, minerals and amino acids in Nutrafol to be absorbed and utilized more effectively. Biotin – An essential water-soluble B-complex vitamin, biotin is one of the building blocks of healthy hair growth, needed to metabolize fatty acids and amino acids. 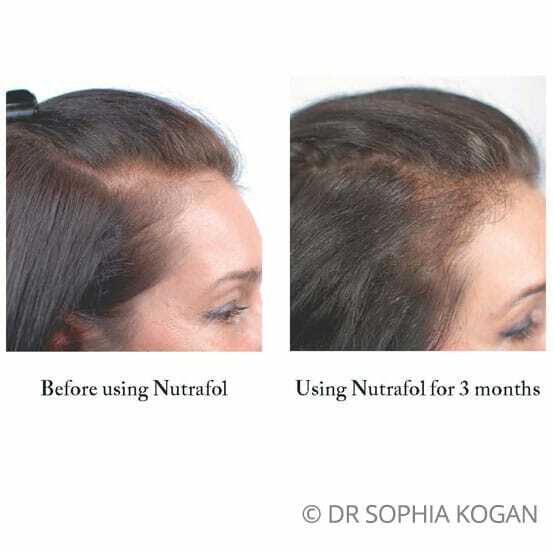 The rich levels of biotin in Nutrafol help strengthen hair, as well as combating dryness, breakage and shedding. Cayenne Red Pepper Fruit Extract – The all-natural, hormone-balancing cayenne red pepper fruit extract in Nutrafol is a powerful agent that helps to combat the effects of stress on the hair, increase protein production and improve circulation in the scalp. It has been shown to decrease levels of the neurotransmitter Substance P, which plays a major role in stress-related hair thinning. The 2-percent capsaicin concentration in our formula activates the release of calcitonin gene-related peptide (CRGP), a compound demonstrated to stimulate cellular energy and boost protein production in follicles, promoting healthier, stronger hair. Horsetail Herb Extract – The herb horsetail (Equisetum arvense) contains high levels of silica (or silicon dioxide), one of the planet’s most common and most important elements. Standardized to 7-percent silica, it contains silicic acid, which is shown to increase the tensile strength and thickness of hair and reduce brittleness. L-Cysteine Hydrochloride – L-Cysteine is an amino acid available in high-protein foods. It contains sulfur, which is useful for metabolic processes in the body-including hair growth. It provides potent antioxidant protection to the follicle and increases hair-shaft diameter, facilitating new growth and giving hair a fuller, thicker appearance. L-Lysine – The essential amino acid L-Lysine promotes hair health when combined with other amino acids. In conjunction with the lysine/arginine blend, it may improve hormone secretion and immune function. Lysine has also shown potential to work with methionine, a rich source of the mineral sulfur and the structural support of the follicle. L-Methionine – L-Methionine is an essential amino acid necessary for hair growth, aiding the development of the hair shaft. It also helps promote overall scalp health and works against graying. Resveratrol – The antioxidant properties of resveratrol work to defend the follicles and scalp against oxidative stress caused by free radicals. Resveratrol also improves blood circulation, enhancing the development, growth and overall quality of hair follicles. Selenium – Selenium produces antioxidant enzymes that can defend against damage to cells, including those in hair follicles. It also helps to maintain proper thyroid function, which benefits the immune system and fosters healthy hair growth. Vitamin A – Vitamin A regulates the synthesis of retinoic acid in the follicle and is an essential component of hair growth and maintenance. It works with zinc to prevent the drying and clogging of the sebaceous glands in the scalp and lubricates the follicles and roots. Vitamin C – The vitamin C in Nutrafol is derived from camu camu, an Amazonian rainforest fruit that contains 60 times more vitamin C per serving than an orange. It acts as a natural stimulant of collagen synthesis, protecting and preserving the body’s existing collagen structures and stores from damage. It’s also a rich source of antioxidants and amino acids. Vitamin D – Vitamin D is a key determinant of richer, healthier hair. A deficiency can take its toll on hair health, leading to weakness and loss. 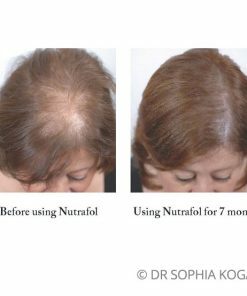 The vitamin D component in Nutrafol helps reduce stress-related damage and contributes significantly to follicles that are rich in vitamin D receptors. Organic Kelp – Our certified organic Icelandic geothermal Kelp is harvested sustainably from the cleanest kelp beds on earth. Kelp is a rich source of natural Iodine and other beneficial bioactive micronutrients. Kelp plays a key role in supporting healthy thyroid hormone production as well as a natural chelator of environmental toxins like heavy metals and toxins that mimic hormones. Keratin – Keratin is a naturally occurring protein in the body and a key structural component of hair. 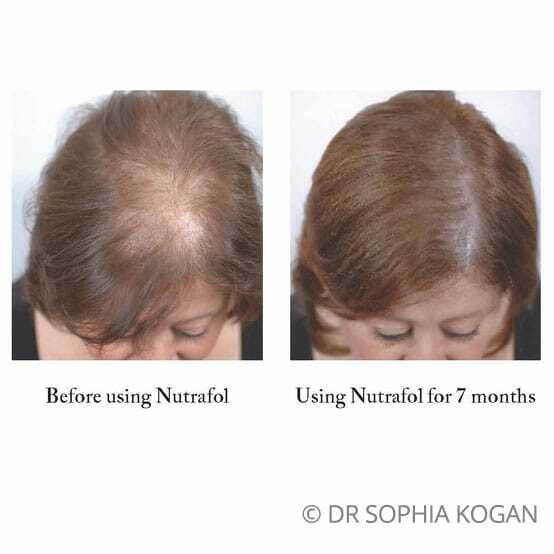 It comprises Cynatine HNS Keratin, the patented form of the ingredient in Nutrafol. Highly bioavailable, it supplements the body with solubilized keratin to protect and repair damaged hair (as well as nails and skin). 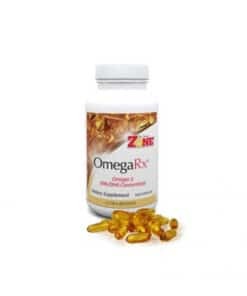 Zinc – The mineral zinc is vital to the body, playing a key role in more than 300 metabolic functions, including cell reproduction, protein utilization and maintaining hormonal balance. It is essential to the synthesis process involved in creating and using collagen and is also a powerful antioxidant-healing wounds and strengthening the glands attached to hair follicles. Nutrafol does not contain gluten, wheat, shellfish, and binders. What is the difference between the 3 formulations? When it comes to hair health, men and women have different biochemical needs. For instance, men may produce higher levels of the hair-damaging hormone DHT, while women may produce less. 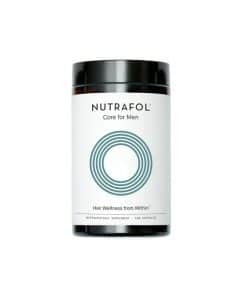 Thanks to years of research, Nutrafol is able to adjust to this by re-calibrating the amount of saw palmetto – a highly effective DHT blocker, in the men’s formula to better target that particular trigger. 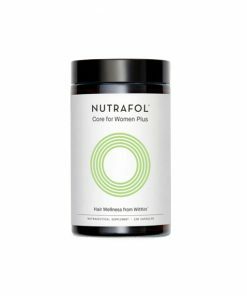 On the other hand, women often need more support against the harmful effects of stress so Nutrafol Core for Women is formulated with the addition of patented stress adaptogens. As a woman transitions into menopause, there is a quick decline in certain hormones like estrogen and progesterone in addition to susceptibility for oxidative stress effects. At that stage, women require extra support through ingredients like saw palmetto, Maca, and Astaxanthin. The Men’s formula has a different concentration of Saw Palmetto then either Women formula. The Women’s Plus formula has different concentrations of Saw Palmetto, as well as the addition of Maca, and Astaxanthin. 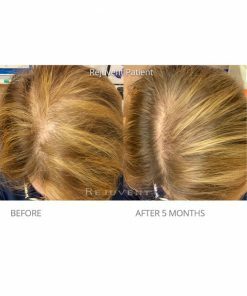 Many patients report seeing increased hair growth and decreased shedding and improved thickness in as little as two months, but everyone is different. 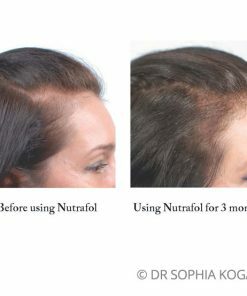 Nutrafol is a program, and like any beauty routine, the more consistent and committed you are over time, the better your results will be. Less shedding. As hair follicles begin to be nourished, you’ll notice less hair on your pillowcase, in your brush and drain. A noticeable increase in healthy hair. You’ll notice that the quality of your hair has changed. It just feels healthier than before. Many users report overall positive benefits to their skin as well. Your hair has now become stronger and more vibrant. It feels thicker and more robust. Thinning and breakage continues to decline and you are excited by what you see in the mirror. 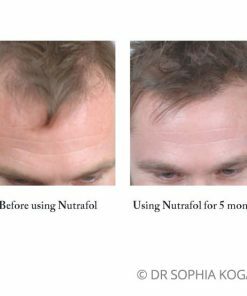 How does Nutrafol Hair Growth Supplements work? Break the ongoing cascade that disrupts hair growth, cycling, and signaling. Remove the follicle from the state of DNAD, recalibrate its signaling, and optimize its environment—empowering it to heal. 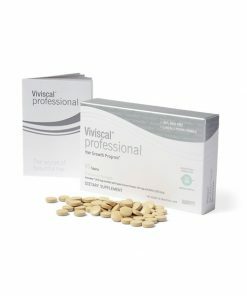 Will Nutrafol grow unwanted hair on other parts of my body? No, and here’s why. Research shows that high levels of the hormone DHT can shrink scalp follicles in both men and women. But for face and body hair follicles, the reverse is actually true where DHT positively signals growth. Saw Palmetto, one of Nutrafol’s key ingredients, has been shown to reduce DHT activity. Meaning that the only hair you’ll be regenerating is where it belongs – on your scalp. 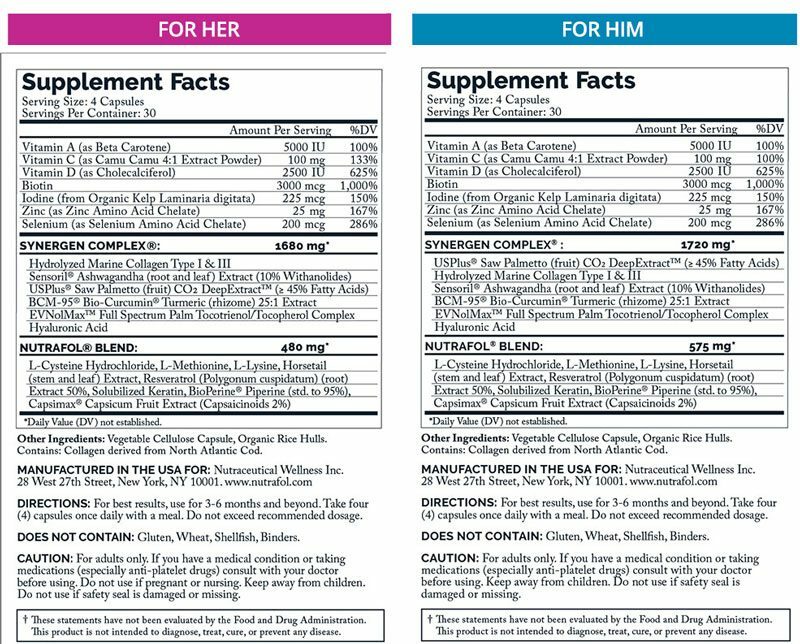 How is Nutrafol different than other supplements? Nutrafol nutraceutical ingredients are clinically shown to improve hair growth and it also has been shown to have many other positive effects below the hairline including reduced feelings of stress and fatigue, improved sleep, circulation, blood flow, blood glucose levels, decreased sugar cravings, boosted immune system and healthier libido. 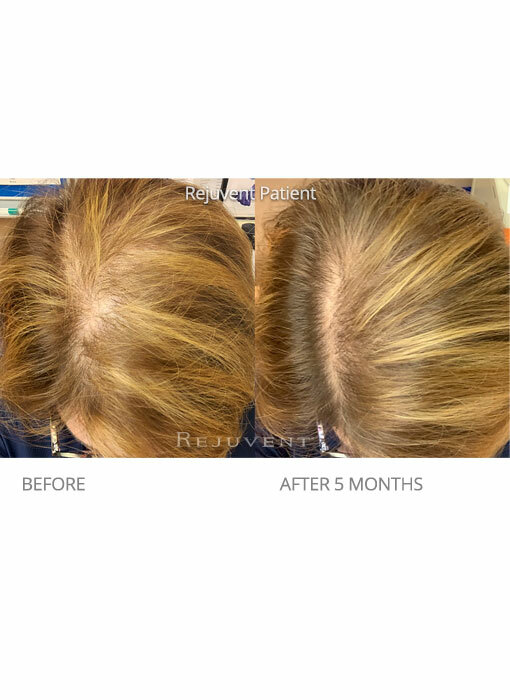 The latest hair research reveals that hair thinning is due to an accumulation of causes—stress (elevated cortisol), hormones (DHT), oxidative damage, as well as the natural processes of aging. Achieving healthier hair requires that you address these underlying causes on a consistent, ongoing basis. 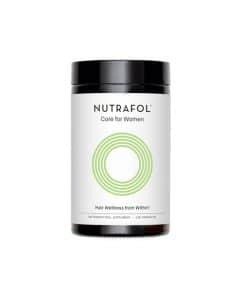 Nutrafol uses specifically selected botanical nutraceutical ingredients with potent and unique properties. These nutraceuticals are bio-optimized and clinically tested for efficacy against these causes. Vitamins and minerals like biotin and zinc, as well as marine collagen (protein) are important for maintaining healthy hair, because they provide necessary nourishment and serve as coenzymes in the mechanics of hair production. However, on their own, they’re simply not enough. Think of it like watering a plant in sick soil. It doesn’t matter how much you water it if the roots are in an unhealthy environment. Same with a follicle – if you don’t address the underlying causes at the root, the follicle is unlikely to absorb and use the nourishment. So before you provide the nutrients, you need to address the health of the environment with botanical nutraceuticals. Take 4 capsules once a day, with a meal that contains healthy fats for better absorption. Take it daily. Nutrafol should not be taken by anyone under 18 and women who are pregnant or nursing. Those taking blood thinning medications should consult their primary care physican.